More than 1,000 men descended on the streets of Plymouth on Saturday as they embarked on a lad’s day out like no other. 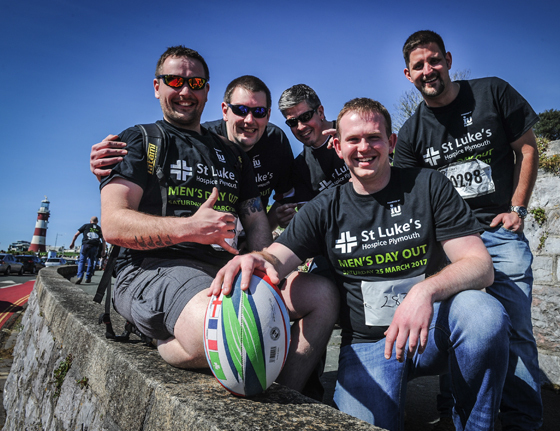 The city’s annual Men’s Day Out, in aid of St Luke’s Hospice Plymouth, proved to be a day of epic proportions. The mass gathering of men took on the 12km route around the city, some adorned in fancy dress, to a flurry of cheers and chants, finishing at the rugby ground for a well-deserved pasty, pint and an afternoon of watching Plymouth Albion take on Newcastle-based Blaydon, rounding off the day with a 45-0 win. This was the first year that the event was a complete sell-out, with hundreds of men from across Plymouth, Tavistock, the South Hams and Cornwall taking part. Mark Slate who works for Plymouth based Bruton Knowles said : “This is my third time taking part. I lost my wife to cancer a couple of years ago and the hospice looked after her. St Luke’s is a great local charity that I am keen to support. This is my way of showing appreciation for the care and support they provided. Neil from Plymstock said “I don’t think there is anybody here today that doesn’t know someone who has received the amazing care from St Luke’s. I’m a healthcare professional and the work they do is absolutely fantastic. The men have come out in force today to raise lots of money and show our appreciation”. Andy Shaw from Crownhill said “Everybody wins, St Luke’s promote their cause and raises a serious amount of money to ensure people get the care they need, the pubs win, Albion win and everyone has a great day out”. The event is estimated to raise in the region of £50,000 for the charity, who provide end of life care to patients in the local community, whether at home, in hospital or at their specialist unit at Turnchapel. Senior events fundraiser at St Luke’s, Marian Kennedy, said, “The whole day was an overwhelming success. It was fantastic to see so many of you walking in support of St Luke’s. We would like to say a massive thank you to IU Energy who sponsored the event, all 80 of our amazing volunteers on the day, Albion Rugby Football Club and the following organisations for their support; Friary Mill Bakery, Morrisons, Tolchards, Devon and Cornwall 4×4 Response Team, Rapid Relief Team, The Roundabout, The Victualling Office and Pilgrim Pasties.